Russian Aleksey Sokolov improved his own course record set last year when winning Monday's Dublin Marathon in two hours nine minutes and seven seconds. Sokolov's time cut two minutes and 29 seconds off his record from last year and left him ahead of Britain's Thomas Abyu who took second in 2:10.37. In a high-quality race, Ethiopia's Dejene Yirdawe was third in 2:11.08. Another Russian Alina Ivanova also repeated her success of 12 months ago by winning the women's race in 2:29.20. Ivanova finished ahead of her compatriot Larisa Zyusko (2:31.42) with Kenya's Nguriatukei Raelikiyara third in 2:33.27. Salford Harrier Abyu's performance will boost his chances of making the British team for next year's Olympic Games in Beijing. Tullamore athlete Pauline Curley (2:42.30) was the leading Irish female finisher in ninth while the top Irishman was Michael O'Connor who took 14th in 2:25.48. Both Curley and O'Connor claimed the Irish national championships being run concurrently with Monday's Bank Holiday race. Curley was pipped for the Irish title by Lagan Valley's Jill Shannon 12 months ago. 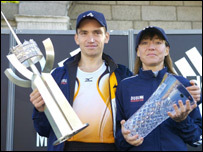 Sokolov's time was the fastest ever marathon run on Irish soil. The wheelchair race was won by Richie Powell of Wales in a time of 1:59:06.